Anna tells Liesl that she wants answers about Valentin. She asks her to reach out to Faison. Liesl refuses to plead her case. Anna says she&apos;s desperate because she needs confirmation if Valentin was a double agent with the DVX. Liesl claims she can&apos;t reach Faison, but Anna knows Faison is with Britt. Liesl wants to know what&apos;s in it for her. She asks that all charges against Faison and Britt be dropped. Anna says she doesn&apos;t have that power. Anna tries a different tack. She says that Nathan isn&apos;t happy with Valentin. She adds that once the fighting starts, he&apos;ll take Nina&apos;s side, which Valentin won&apos;t tolerate. She wants Liesl to help now in dealing with the problem. Liesl turns her down. Laura&apos;s still complaining about Andre&apos;s testimony to Kevin, who admits he would have judged it the same way. Kevin feels taking Charlotte away from Valentin will only be harmful right now. 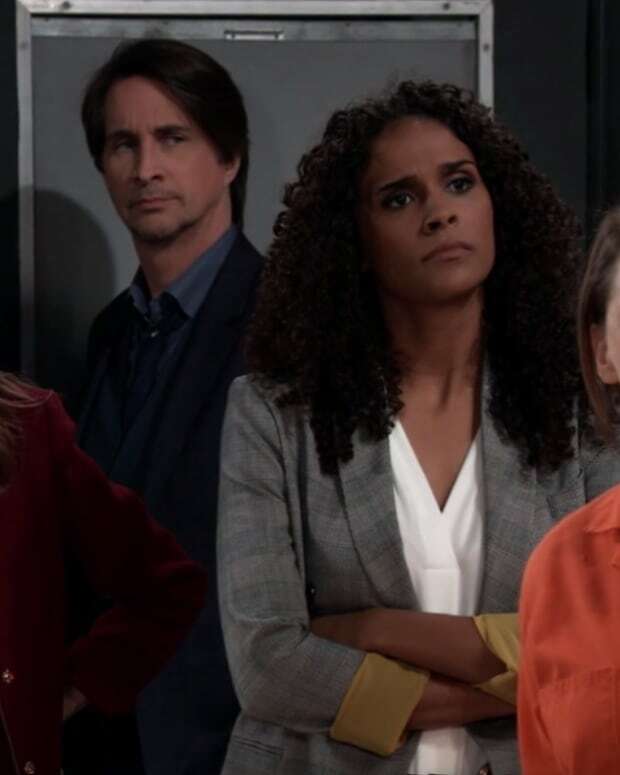 Laura worries that Valentin will rig the system and all she&apos;s trying to do is protect her granddaughter. Lulu shows up at Crimson to yell at Nina, but finds Dillon instead. She complains and explains about the custody hearing. Dillon tells her that once a week visitation is not a total disaster. Dillon brings up Maxie&apos;s custody for Georgie and how she had to play by the rules. Lulu doesn&apos;t want to play by the rules when she&apos;s fighting a man who murdered her brother. Nora tells Valentin and Nina not to give Lulu any reason to fight them on the custody agreement. Nina questions Valentin on what Lulu might find in his past. Valentin admits that he&apos;s done what needed to be done to protect his daughter, but that there is no evidence against him. Griffin shows up at the courthouse to testify at Liv&apos;s competency hearing. Liv calls him Duke. She says she doesn&apos;t see any of his mother in him, which upsets Griffin. Nora arrives as Liv&apos;s lawyer. She tells Griffin to back off the crazy lady. Nelle and Charlotte run into Michael. She explains that she got a job as a nanny to save up money to finish her education degree. Michael says he thought she was leaving. He wonders why she would stay where she&apos;s not wanted. Nelle says she wants to make amends to him and Josslyn. Michael tells her that the best she can do is to leave them alone. Laura walks in and says hello to Charlotte and introduces herself to Nelle. The judge reads the charges against Liv. They include Morgan&apos;s murder, Griffin and Robin&apos;s kidnapping, Anna&apos;s assault, possession of a weapon of mass destruction, and 315 counts of attempted murder on everyone who was still in the hospital. Kevin testifies that Liv is lucid, but has no moral code. The DA counters that Liv could be faking. The judge decides that Liv lacks the capacity to stand trial and remands her to Darkham mental facility. Valentin meets Nelle and warns her that if anything happens to Charlotte, they&apos;ll never find her body. Liesl spots them and makes a call. Laura questions Michael about Nelle. Michael says she&apos;ll have to ask Carly what happened and that he and Nelle are not friends anymore. Later, Laura tells Lulu that Nelle might be useful to them. Griffin updates Anna about Liv&apos;s hearing. Anna&apos;s happy that Liv will never get out of Darkham. Griffin tells her about Liv&apos;s comment about his mother and wonders if Liv could have known her. Anna tells him that Liv was just trying to get under his skin and to let it go. Valentin meets with Nora to pay her and thank her for dealing with his "associate" Liv. She promises Liv will never see the light of day again.